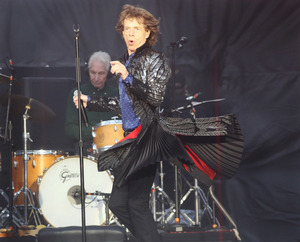 Mick Jagger, Keith Richards, Ronnie Wood, and Charlie Watts from The Rolling Stones on the first leg of their The Stones – No Filter Tour. 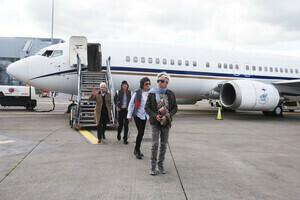 After their show the band flew back to the UK to continue the tour which includes London, Edinburgh & Cardiff. How was it for you, anyone? Posted in Misc and tagged The Rolling Stones at 9:34 am on May 18, 2018 by Bodger. This is one for our man Ivan I reckon…. I have to say I really enjoyed it. Of course it helps when Mr Nice Aiken man sidles up to you with Pit B wrist bands. You could see every wrinkle. Great night. They’re obviously getting on a bit but the tunes will always be great. There’s not many bands anymore that can even nearly fill a stadium. The sound was a lot better than some previous Croke Park gigs I was at. One minor gripe, they were selling pints on the way in and wouldn’t let people bring them on to the pitch and no one was taking card which is a bit mad these days. 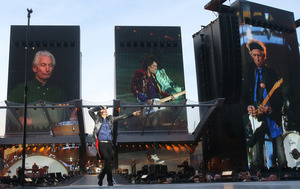 Based on past experiences, you should go to a Stones gig with, er, No Expectations and then if you’re pleasantly surprised it’s a bonus; not because they’ll be crap but because just the playing can be a trifle more shambolic than you’d hope for with the ticket price. 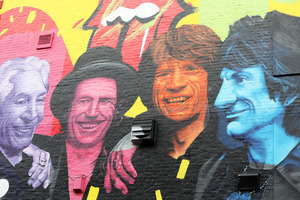 Sure, Charlie’ll be rock solid, and Jagger will always deliver your money’s worth but Ronnie’n’Keith? Lovely lads, but there was a time they were the Drunken Bakers of Rawk and it could really get messy. That’s not to say they weren’t fun to watch, or whatever, but you’d look around and see other fans with the wee glimmer of a flinch passing across their eyes. Not that they’d say it out loud but they knew. We all knew. So when you fast forward to 2018 it’s with a hint of trepidation that you tip up to Croker; the sound’s awful in the stands, innit, so we’ve plumped for bog standard pitch standing. We’re there at quarter past six and pretty much at the crash barrier keeping us back from the Golden circle. The two girls from Belfast ask us old lags if there’s any way that they can, y’know, scooch into there, only for us to *hilariously* point out that it’s a hard border. The Academic are grand; the venue’s too big for them and the audience (those that have bothered to turn up at this point) are too interested in having a chat and a larf. Their final song is that one that goes “Hey Ho Ian Dempsey Breakfast Show” so it’s nice to know who sang that. Half eight isn’t long coming around, and the giant screen yokes with the yellow background and the scribbled tongues on them suddenly go dark, and with minimum of fanfare, the supercharged samba of Sympathy kicks off, with just Charlie, Mick and a few sidemen on stage until the first *krungg* of guitar and our guitar heroes arrive. I look at Eoin and he looks back at me, and we’re both mentally crossing our fingers ‘don’t fup it up you fuppers…’ and they don’t. 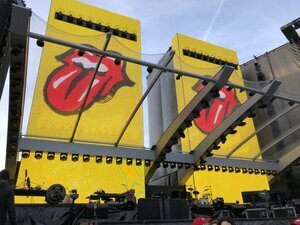 The sound (on the pitch) is great and the setlist (https://www.setlist.fm/setlist/the-rolling-stones/2018/croke-park-dublin-ireland-bede996.html) is grand. Heresy ahoy. 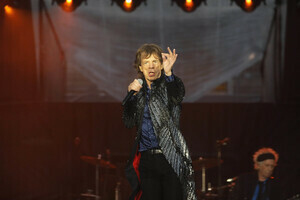 I can live without Midnight Rambler. I thought it was dragged out and overcooked when i first heard it on the Hot Rocks cassette I bought oh-so-long ago and I still do now. I still largely skip it on Let it Bleed and it truly doesn’t need to be fifteen minutes or so. Same goes for Miss You, of which I need only say two words: Bass solo. How was the playing though? Were they phoning it in? No, no they weren’t. Normally at this point, the Samuel Johnson quote about the dog walking on its hind legs comes to mind; that it’s not how good they’re doing this at the age of whatever, it’s that they’re doing it at all. But here’s the thing. they *are* doing it good, and at that age. They belt out two tracks off 2016’s Blue and Lonesome covers album and they’re just a very tight blues band, and Mick’s harp playing is a joy to hear. It’s quite clear that Keith’s cleaned up his act; there was definitely 70% less posing and shape throwing from him, and significantly better guitar playing, so much so that at times, I think even *he* was pleasantly surprised. Some misinterpret Charlie’s, hur hur, stone face for disinterest; they’re wrong. It’s part of the act. He’s meant to look like a faintly disappointed headmaster, slightly confused by what the hell has landed him where he is; but listen to the noise he gets out of that kit and wonder no more. 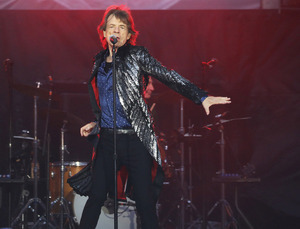 Jagger? Where to start. Look, he knows it’s faintly ridiculous at this stage but he runs, and pouts, and struts and shimmies and then, when he wants to get the audience to clap he does this fast-clappy thing that reminds me of The Wife last Saturday when she realised I’d be out of the house for the Eurovision. He has the audience in the palm of his hand. If he’s got an iffy throat, it doesn’t sound like that, though he’s glugging away on some potion or other a fair bit. He takes his usual 2 song break for Keith to sing; we’re too deep into the crowd to nip out for a toilet break, but once that’s over, we’re back on the home strait and the closing double whammy of Gimme Shelter and Satisfaction are just immense, the former still sounding just as sinister and just as nasty as it did fifty years ago. If this is the last we’ll see of ’em here, they did themselves proud. Got given a ticket day before. Wouldn’t have thought about going otherwise, but was pleasantly surprised. 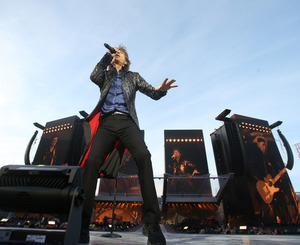 Was worth going for their performance of Gimme Shelter alone. Spine tingling! a decent day at work (no eejits to deal with) a lovely lunch in the sun then got lucky with 2x freebie standing & brought someone special, great gig, sound setup was exceptional prob best I’ve experienced at Croker & they were very impressive proper old pros at work. oh & dunno who he is but that bassist lad was superb. 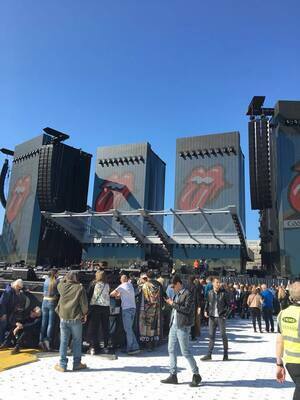 I really enjoyed it… fair balls to Jagger, jesus he’s unreal, I’m 34 and I was worn out just watching him!!! I paid… boy did I pay… we were lucky to randomly get the passes into the very front pit – we were in the Gold Circle area initially. Great gig. Proper rawk noise at times. Miss You was absolutely amazing. It, Gimmie Shelter, a slightly slowed down Paint it Black and amazing version Wild Horses the highlights. yeah, i meant to say above (‘cos i wrote it on the fly) was that the screens were absolutely stunning and in particular the graphics during Miss You (whatever about the need to trim 4 minutes off of it) were fab. Concert was outstanding. Bought VIP tickets for €199, they turned out to be General Admission to the pitch with a bag of very cheap tat worth at most €10. Take my advice and avoid this ticket type, it’s a complete rip off. Very disappointed.